Sitiawan, which is in the district of Manjung, is perhaps most noted for its Foochow heritage because this was where they first set foot when they arrived here. It all started on Sept 9, 1903, when 363 Christian Foochows led by two Chinese pastors came to Sitiawan with wives and children in tow.The immigrants settled in what is today known as Kampung Koh. Desperate to escape the poverty in Fujian in south-east China, the pioneers worked in rubber plantations in Sitiawan. Soon, they started building schools and Churches which they laid great emphasis on. Since then, the Foochow heritage has been prominently identified with Sitiawan. In fact, residents of Kampung Koh will tell you that anyone above the age of 80 living in the village is a direct Foochow descendant from China. A five-minute drive from Kampung Cina will take you to Kampung Sitiawan and the infamous Dindings river. In fact, Sitiawan got its name from an incident involving two elephants and the Dindings river. The making of mi sua, gong pian biscuits and gor loo (soup cooked with fish stomach) are all part of this tradition which is a vital part of the daily living of the residents of Kampung Koh today. Gong pian is made using lard, onions, salt and flour. Once the ingredients have been stuffed into a ball of flour and flattened with a rolling pin, they are slapped onto the sides of a homemade traditional Chinese oven. The biscuits take approximately 15 minutes to bake and sell at the rate of 1,200 a day at the Cheong Cia Gong Pian shop (the only one of its kind in the country selling this particular type of biscuit) in Sitiawan. Apparently, one has to acquire the taste for the biscuit before one can appreciate it. 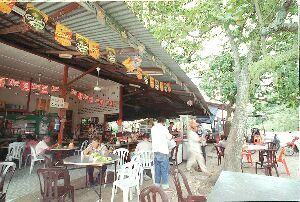 Next to Kampung Koh is Kampung Cina, which is lined with seafood restaurants. The cheap seafood and fresh coconut water is the trademark of these restaurants popular with the locals of Sitiawan. The main attraction however is that all the seafood restaurants are built under coconut trees. When looking for a seafood restaurant in Kampung Cina, just look out for the coconut trees. 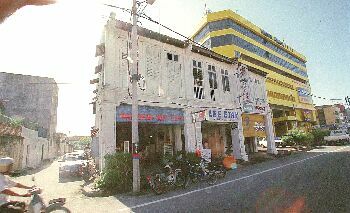 Kampung Koh, however, is not just famous for its Foochow heritage but also for its chilli sauce. The 20-year-old Koki chilli (Kg.Koh Cili), which started off as a humble grocery shop, produces approximately 3,000 bottles of chilli sauce a day. Miles of rubber plantations changed to oil palm plantations, which in turn is being replaced by countless housing schemes, condominiums and hotels. Prices of property is going up as well because the Lumut naval dockyard has been privatised and is attracting manufacturers. A sleepy Sitiawan is thus starting to awaken with the advent of development. Although many of the residents own cars, it is more common to see motorcyclist especially on the kampung roads. Most of the young people in Sitiawan, with a population of 7,193 (1991), have left to seek their fortunes in larger cities. Some have even gone to further their education in these cities after their Form Five as Sitiawan has no colleges. You Are Visitor Number ..
Development is beginning to change the face of Sitiawan, illustrated here by the sharp contrast between Wisma Ganda, a shopping complex, and pre-war shophouses. This is an unofficial web-site created by X-MYFers to commemorate musicals held in Wesley Sitiawan in the past.